Click on the “Add New” button in the right-hand side of the site-header to view the menu-options. Click on”YouTube” to add a public YouTube-video. | NB: YouTube video’s will be added through embedding. Tick the ‘I agree to the above terms and conditions’ box. | NB: You cannot undo the ticking of the box! After ticking the box a new portion of the website (“YouTube”) will appear. 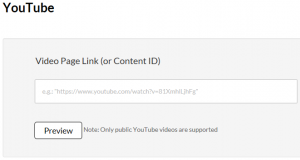 Copy and paste the YouTube video link into the field with the text “Video Page Link (or Content ID)”. | NB: the lightly printed text will disappear when you click on the field. You can now see an example of the video with various fields you can enter info into. | NB: The information you add to this video is only visible within the videoportal, the original video will be left untouched. Enter the required fields. 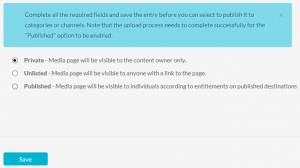 | NB: Video’s without the “name” and/or “description” field entered cannot be shared. Scroll to the bottom of the page and press “Save” to add the video to your collection. As soon as the video is saved the “Go To Media” button appears next to the “Save” button. | NB: There won’t be a notification that saving is successful! 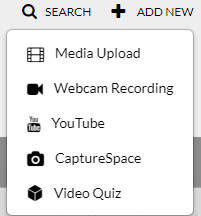 Click on “Go To Media” to go to the added video directly.